Symmetry Rehab is a group of allied health professionals that provide a range of therapies to patients of all ages and lifestyles. Therapies that aid in healing, restoring function, and improving performance. Examples of the many issues our Vancouver Physiotherapy, Kinesiology, and Occupational Therapy practitioners treat on a daily basis are described below. Despite everyone’s best efforts, accidents do happen. It might be a slip in the bath tub, a mishap at work, or a fall on the ski hill. Such accidents can cause a wide range of injuries, from minor to devastating, but in each case, getting well again, as quickly as possible is a goal we share. Here are some of the issues we can help with. Broken Bones – Broken bones take time to heal. While that is happening, our goal is to ensure that you are still able to live, work, and play as much as possible. We also want to minimize any collateral loss of function or strength. It’s best to set up an appointment with one of the members of our Vancouver Physiotherapy team as soon as your cast is on. Sprains and Strains – Most sprains and strains just need rest to repair the muscle and connective tissue that’s been injured. However, there are some therapies that can help to speed healing, and to help ensure that resting the injured area doesn’t cause loss of function or strength elsewhere. Concussion – Concussion is a form of traumatic brain injury that results from a sudden blow or intense jarring of the head that causes the brain to shake within the skull. Concussions range from very mild to very serious, and all suspected concussions should be assessed by a physician immediately. The physician will determine the level of injury, and based on that assessment, will provide instructions on what you should and should not do during your recovery. With that information, our Vancouver Occupational Therapy practitioners will work with you to avoid what you shouldn’t do while still managing your daily life activities. Traumatic Brain Injury – The term traumatic brain injury is usually used to describe injuries to the brain that are much more serious than a concussion. These injuries may include a skull fracture or penetration of the brain with a foreign object. Traumatic brain injuries affect each person differently, and can result in a range of issues include loss of speech, difficulty walking, cognitive decline, and other problems. Creating and implementing an appropriate rehabilitation plan may be essential to recovery, and may even be started while you are still in hospital. Following up with members of our Vancouver Kinesiology and Occupational Therapy teams once you are discharged will ensure that you continue to regain function and learn to adapt to any long-term changes in ability. Spinal Cord Injury – The spinal cord is the main pathway from the brain to other parts of the body. If the spinal cord is severed, messages from the brain are not able to pass beyond the point of injury. Some spinal cord injuries are less impactful, allowing some function below the injured area. Therapy, such as that provided by our Vancouver Kinesiology and Occupational Therapy teams, is often recommended as a key component of recovery. Since the spinal cord controls all movement, rehabilitation therapies are important in both regaining function and in finding adaptations to previous capabilities. Stroke – Stroke is a term that refers to the death of cells in the brain, stemming either from a blockage of blood flow, or bleeding within the brain that results in cell damage. The impact of stroke varies greatly, depending on the location and number of cells affected. In many cases, the impact of stroke can be minimized or even eliminated, by rehabilitation therapies. The brain’s ability to adapt to injury by creating new connections or pathways, is known as neuroplasticity. Forming these new connections through specific, repeated exercises and activities is the focus of our Vancouver Kinesiology, Physiotherapy, and Occupational Therapy teams, when working with stroke patients. Heart Attack – A heart attack, or myocardial infarction, occurs when the heart is deprived of blood and oxygen. Most often, this is the result of a blockage forms by plaque deposits in one or more arteries to the heart. Rehabilitation therapies focus on recovery as well as the prevention of future similar events. Sometimes called cardiac rehabilitation, our Vancouver Occupational Therapy, Kinesiology, and Physiotherapy practitioners, work with patients to improve heart function, and to minimize the risk of future heart attack through diet and exercise. Back Pain – It is estimated that 50 to 85% of all Canadians will experience back pain during some period of their life. Back pain can be caused by an injury, such as a fall, but is often the result of less obvious factors. Shoes without sufficient arch support, loss of core muscle strength, or inappropriate posture, can all cause back pain. It is important to identify the reason for the pain and have it treated sooner rather than later. Our Vancouver Kinesiology team are experts in human body movement and can help you determine the cause and alleviate back pain. Chronic Pain – A number of conditions and illnesses can result in wide-spread chronic pain in the muscles and joints. While your physician is best suited to diagnose the reason for your pain, our Vancouver Physiotherapy, Kinesiology, and Occupational Therapy team members can help you create and implement a pain management program. Such a program may include particular exercises, diet modifications or breathing techniques. Several members of our Vancouver Kinesiology team are experts in athletic performance improvement. Using both physical exercise and psychological techniques, our practitioners can help you be the best you can be. Symmetry’s Registered Physiotherapists, Kinesiologists, and Occupational Therapists possess a high level of knowledge about injury rehabilitation. We strive to maintain a professional approach while motivating our clients. Kinesiologists possess specialized training courses in Postural assessment, Core stabilization and Functional exercise prescription. 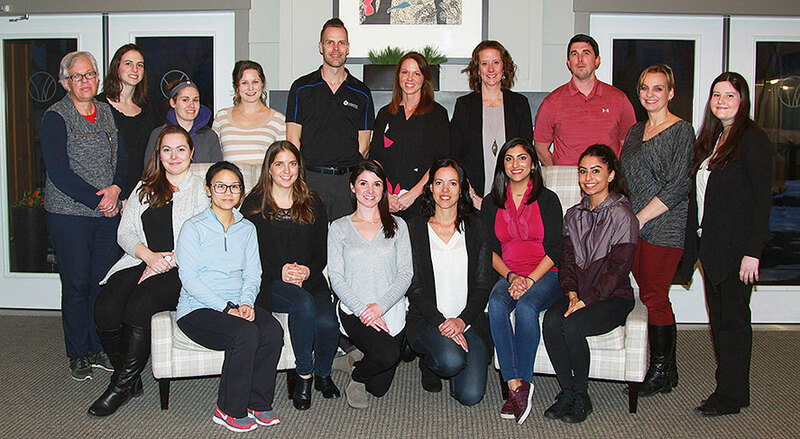 OT’s possess successful completion of the Canadian Association of Occupational Therapists Certification exam.